Palm Sunday marks the triumphant entry of the Lord Jesus into Jerusalem in the week before His death and resurrection. He set to go to the old city to make history; to overcome all of hell. What do you think would happen if Jesus entered YOUR home? Certainly all that has been tormenting you and your loved ones would be destroyed; addictions would be shattered, conflicts would be solved, your house would be filled with peace and unity. Join us on Sunday March 29th at 10am as we invite Jesus into our families. Bring a palm to be blessed. Good Friday is undoubtedly the most powerful and life-changing day in history. All the sins, burdens and curses of those who believe were nailed to the cross. Faith in this single event can set you totally free. Are you sick? Depressed? Entertaining suicidal thoughts? Cursed? Have you been a target to envy? Are you trapped in an endless downward spiral? Join us on Friday April 3rd at 3pm for a powerful service. 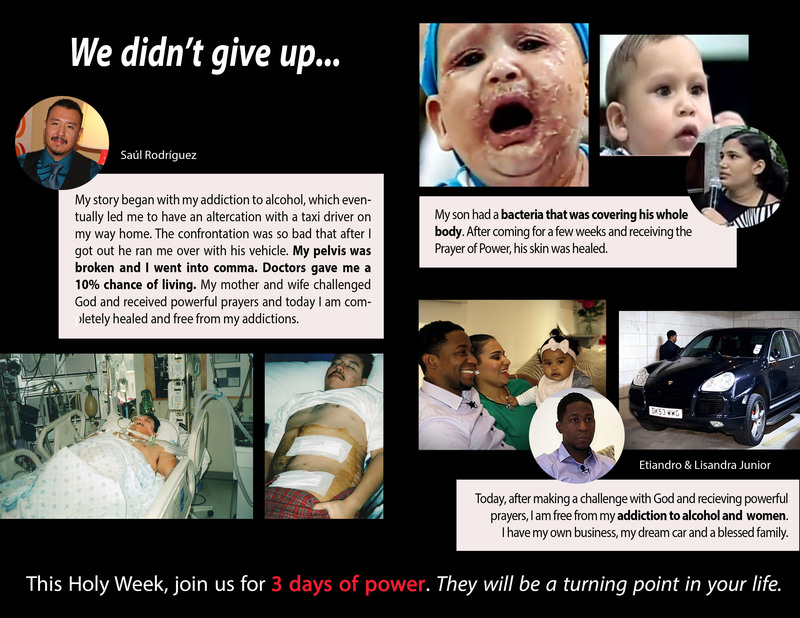 We will be making strong prayers and working to set you totally free. Easter Sunday is known as the day of resurrection, a day when death and evil were overcome by Jesus’ sacrifice on the cross. What Jesus did for us is far more than just a holiday to commemorate an event in history. On this day, we will pray for the resurrection of all that’s dead. Effective prayers will be made for the restoration of marriages, for singles to find love, for the sick to be healed, for all those present to overcome misery and debt. In sum, the Spirit of God –that visited Jesus tomb and brought life back into His dead body– will visit you and do likewise! 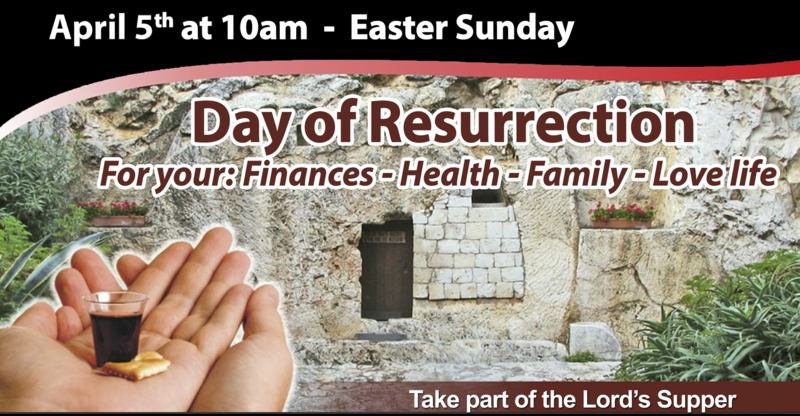 Join us on Sunday April 3rd at 10am and come also ready to take part of the Lord’s Supper. Take a look at what faith can do for you.